Slip on this latex bodysuit that slims your torso while training your body to burn fat at the same time. In addition, it naturally shapes your booty. 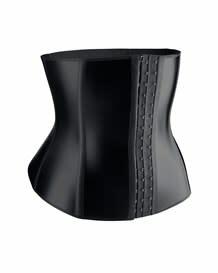 It offers extra firm control so your body looks smooth and shaped while working out to reduce inches. 1. Make sure all hooks, clasps and zippers are open. 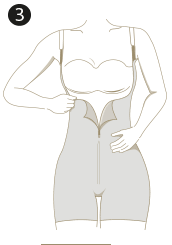 From a seated position, take the bodysuit by the sides and put one foot at a time into it. Pull the bodysuit up to your knees. 2. 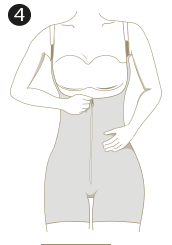 Stand up, and spread your legs apart and continue to pull the garment up to a comfortable fit. 3. Put on the straps and adjust them to your comfort. Use a mirror to check that the garment has not rolled up and is in its rightful position. 4. To close it, hook up the inner hooks from the bottom up and then close the zipper. If open-bust, the shaper should be placed to surround the bra on the bottom.